GO blue GO sapphire! 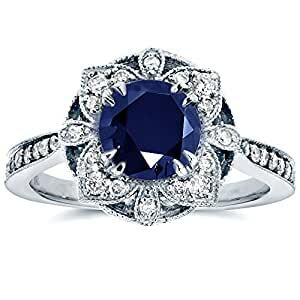 Embrace your femininity and add an original sparkle to your style with the adorable marine color of this beautiful sapphire ring, that can undoubtedly be ‘the one’ for your engagement. Its antique floral motifs in sterling white gold are a reason more to go for it. The entire creation is waiting for you with 33 sparkly diamonds, with a total diamond weight of 1/4 ct. Ordered this ring for an engagement. Of many, it was the first that caught my eye and the one that I kept returning to while shopping around every conceivable online jeweler. The order was extremely satisfying including using the contact seller feature to add an engraving for no additional charge. Price of ring was unbeatable for the quality. Have not had appraised to be fair, but it is definitely a fine piece of jewelry. My wife absolutely loves it! This ring is beautiful. It really sparkles and the picture does not do it justice.